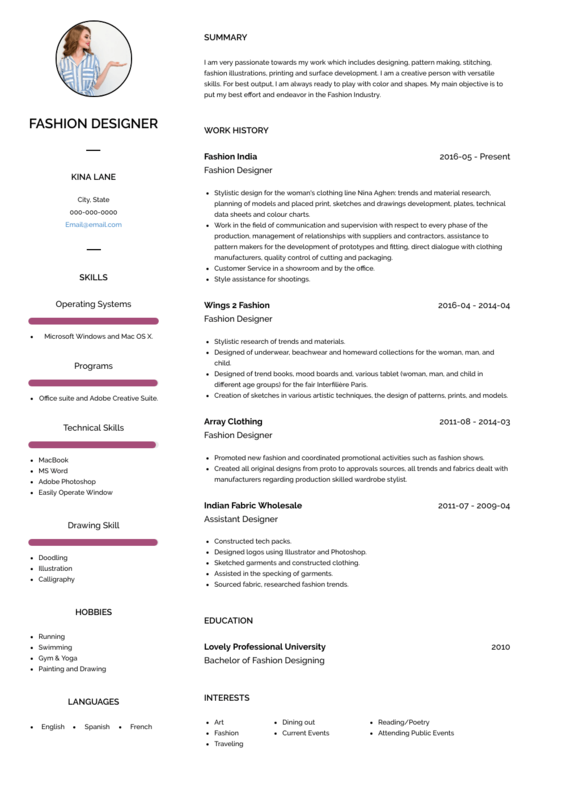 This page provides you with Fashion Designer resume samples that you can use for inspiration in writing your own resume, or for creating one through our easy-to-use resume builder. Below you'll find our how-to section that will guide you through each section of a Fashion designer resume. As a fashion designer, you are a professional who has been passionate about fashion for a very long time: keeping up to date with all the latest trends doesn’t feel like work to you as you absolutely love it. You’re quite good at sketching designs and selecting materials and you have a part in all the production aspects of their designs. You are great, you work behind the scenes and consumers love you, but you’re finding it difficult to create a standout resume. You’ve spent hours and hours on Google searching for the best Fashion Designer resume, and you’ve finally reached your destination: VisualCV has helped thousands of professionals in the fashion industry get the job they have always dreamt of and we want the same for you. Let us help you build the best resume ever: for yourself, for your brand, for the recruiter and for your future employer! Did you know that most resumes don’t get more attention than 15 seconds? Crafting a strong fashion designer resume is not only important, it is fundamental! As per the format, the reverse-chronological layout will introduce the recruiter and hiring manager to your most recent best achievements upfront. It’s the same with the colors used in the resume. You are a fashion designer and, while using a couple of colors to highlight the more important elements can appear to be a good decision, make sure you don’t exaggerate! Your future employer can think it’s a bit childish to have a rainbow of color on your resume. Check the grammar before you send your resume away and save it as a .pdf: Microsoft Word is not a big fan of creative resumes like yours! Competition as a Fashion Designer is so fierce that you need to stand out from the crowd: think of this section as if you had 60 seconds to pitch the recruiter and after that you’d be either onto the next section or out of the door. Say you will be the “best Interior Designer” more than once. Have you created and implemented brand new fashion designs and concepts? Have you customized clothing lines and signature series? Have you been working with the Creative Director and been organizing photo shoots? What has been your best achievement? Were you involved in any work that has been published on famous fashion magazines? Education is fundamental for a Fashion Designer resume: if you have attended college or have earned an associate degree in Fashion Design, please include them as it will show your knowledge of theory, techniques and art/fashion history. If an excellent Fashion Designer Resume sample is not enough, why don’t you check out one of the most efficient Fashion Designer resume templates in the market? Many professionals like you have successfully used it to take their career to the next level.